My family moved twice when I was young - from northern England to Canada when I was four years old, and again to New Zealand when I was thirteen - I started school in Toronto and completed high school and university in Auckland, New Zealand. Other than four years when I lived and worked in Saudi Arabia, I have lived in New Zealand all of my adult life. I spent many happy hours in my school libraries, lying on the floor reading on cold winter days. My favourite book was Charlotte's Web by EB White, and my favourite book series was the Little House series by Laura Ingalls Wilder. Girly books you might say. But by the time I was a teenager I was reading anything and everything by Oscar Wilde and Stephen King. I had to give up Stephen King when the nightmares interrupted my sleep. Now I really enjoy reading historical and contemporary fiction. My favourite authors these days are Barbara Kingsolver and Chris Cleave. My husband Darryl Torckler is a very talented photographer and we have collaborated on many books together. Darryl and I met through our shared love of scuba diving. 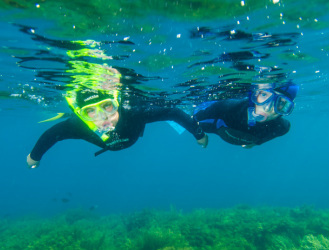 Together we have travelled to many different places to dive, and we are now enjoying taking our two sons to our favorite snorkeling locations in New Zealand. We have no pets, mainly because we travel too often and besides we have an ocean full of animals to keep us company.